In 1990, this mural titled Nation of Islam at Charles Place in Brooklyn was created. 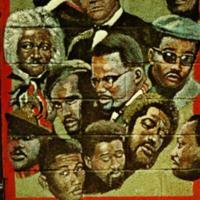 The mural unites many radical figures of black history, including the antislavery leader Frederick Douglass, W.E.B. Du Bois, Elijah Muhammad, H. Rap Brown, Malcolm X, Marcus Garvey, Eldridge Cleaver and Bobby Seale. It has now been destroyed. In 1968, after the success of Chicago’s Wall of Respect in 1967, muralist Leroy White painted Wall of Respect/Up You Mighty Race in St. Louis, Missouri. The mural was self-sponsored. 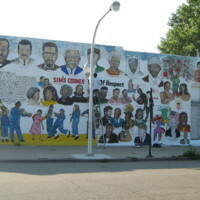 After seeing Chicago’s Wall of Respect in Ebony, muralists in St. Louis were inspired to create public art in the Carr Square area of the city. 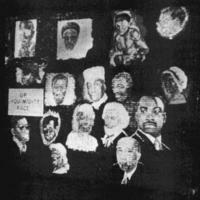 The mural was completed by a coalition of individuals from civil rights groups, including CORE, ACTION, and the Zulu 1200s. It displayed a pantheon of black heroes, including the antislavery leaders Frederick Douglass, Malcolm X, Martin Luther King Jr., and Marcus Garvey. 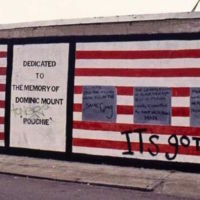 The mural quickly became a hub of black activism—bringing together artists, performers and political figures in a series of concerts and rallies at the site. But it was vandalised during the 1970s, and its building was razed in the 1980s.